Though essential oils sound healthy and natural for your hair, this isn’t always the case. Commonly used essential oils for hair loss include pumpkin seed oil, peppermint oil, and mixtures of lavender, rosemary, cedarwood and thyme. However, there is limited research on using essential oils as an alternative method to combat hair loss, but there are a handful of animal studies out there. In 2014, one study done on female mice suggested that lavender oil could be used as a hair growth promoting agent. Improvements in hair follicles and their depths, as well as increased dermal thickness were the most noticeable changes. A study on mice comparing saline, jojoba oil, 3% peppermint oil and 3% minoxidil resulted in the peppermint oil having the most promising hair growth effects. It is believed that the peppermint oil speeds up the active growth phase, known as the anagen phase. Another study on 50 patients experiencing Androgenetic Alopecia concluded that rosemary oil and 2% minoxidil both had significant hair growth results. When examined at the 3-month mark, no significant changes were observed, but when examined at the 6-month mark, both groups experienced hair growth. Should you use essential oils with Keranique? Keranique Hair Regrowth System is formulated with a blend of plant-derived sources and lab-tested ingredients with proven results. For example, the system’s Scalp Stimulating Shampoo contains peppermint oil already, so introducing more of this powerful oil to an already fragile scalp may not have the intended results. 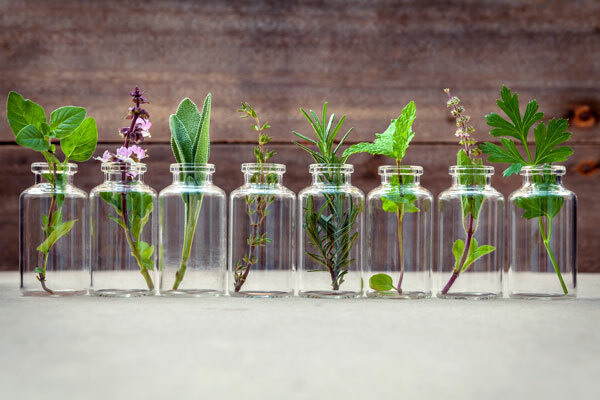 In fact, with essential oils growing in popularity, emerging stories of misuse have been reported, including alarming rashes and even toxic reactions when not used properly. 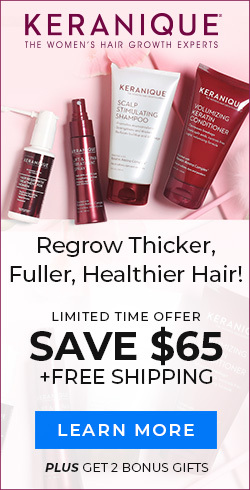 The best route to go when it comes to picking a hair loss treatment option is speaking with your doctor before using any essential oils as they can be caustic to skin. Keep in mind, 2% minoxidil is the only FDA approved ingredient clinically proven to aid in women’s hair regrowth. Remember, whenever you use essential oils whether it be applied to skin or hair, you must dilute the oil with a carrier oil. Essential oils are not recommended for use in people who are pregnant, prone to seizures or have heart conditions. This entry was posted in Hair loss, Keranique Reviews, Thinning Hair and tagged coconut oil, essential oils, marula oil, natural products. Does Keranique contain any coconut? Select the product that you are interested in, and beneath the photo of the product, there is a tab labeled ingredients which displays the full ingredient list. Please don’t hesitate to reach out if you have any other questions. Our Customer Service team is available 24 hours a day at (888)237-4131. Hi Christine, great question. A carrier (or base) oil is typically a vegetable oil (coconut oil, olive oil or avocado oil, for example) used to dilute and aid in the application of the oils to your skin to mitigate potential skin rashes or reactions that can happen with essential oils. Hi Virginia, Great question! Women of all ages not only experience regrowth but they also experience thicker, stronger, and healthier hair with Keranique Regrowth System! Keranique is made for women of all ages, with all hair types-We offer a full 120 day money back guarantee to ensure your satisfaction! Hi Ruth, you can definitely use Keranique Shampoo & Conditioner the same day that you use Keranique Regrowth Treatment with 2% Minoxidil. In fact, it is very important to use Keranique Regrowth Treatment twice a day, every day. I have sent a contact request to our Customer Relations Team to better assist you with using Keranique to attain your goals! My hair is dry and brittle since I’ve started using the shampoo/conditioner. Its hard to style and looks thinner.